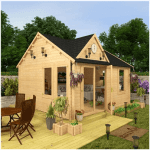 The charming and classy Leaded Corner Summerhouse is going to give you a fun and relaxing little space to spend some quality time in. This is made for those of you who do not have a large garden or who just do not want a summerhouse taking up all their garden real estate. It has a very smart and classic look to it. This is achieved with the leaded half glazed windows on the sides and door. The door even has some very classy looking antique style fixtures that really do finish the front of the summerhouse off just perfectly. This corner summer house may be compact, but it still manages to provide well over 6 feet of headroom. 12 mm tongue and groove cladding that is backed up with a thick frame is what makes this such a robust summerhouse. You are going to get many years of use out of this as it is such a well made and strong structure. Both the roof and floor are made with tongue and groove boarding so the inside has a very high class and strong look to it. The pent roof is going to ensure that the rain stays out and those large double doors are going to provide you with a lot of security. The Leaded Corner Summerhouse is one very impressive looking corner summer house that is made for those who want something that can just sneak into a corner of the garden. 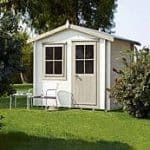 The compact nature of this summerhouse means that if you do not have a large garden then it would be ideal for you as it is one of the smaller summerhouses out there. The width and the depth are right around 6 feet so while on paper this does not sound very large. If you are smart with how you use the space, you can actually fit far more in here than you would think. It is quite a tall structure as even at the eaves it stands at over 6 feet high. This means that you will not have to hunch over when you are inside of here. The pent roof is very well made as they have used tongue and groove boarding which looks very nice inside the summerhouse. This kind of boarding is also very strong and that along with the felt covering make one very impressive roof. The roof does slant towards the back so the rain will most of the time not run off where the door is. We really like this roof and to finish it off they have used a very smart looking diamond shaped decoration just above the door. The walls of the Leaded Corner Summerhouse are made with this fantastic looking redwood. They have used this redwood to make tongue and groove shiplap cladding that is 12 mm thick. So as well as having a very classic and smooth kind of look, this cladding is also very thick and strong. Plus the fact they have gone for tongue and groove cladding means that you will have no worries about rain getting into the summerhouse. This is a corner summer house that has been designed to be placed into a corner and then sit there for many, many years. Part of what makes this such an impressively robust structure is the frame that they have used to keep it all together. We were very happy to see that they have used a 44 mm x 34 mm frame that is made from the same kind of redwood as the cladding is. This along with the cladding makes the summerhouse a very sturdy structure. Under your feet is some very high quality tongue and groove flooring. We love this and in an ideal world all summerhouses would have tongue and groove flooring and roof boards. This kind of floor is not just chosen to look pretty. This flooring is also able to take a lot of weight so no matter what you plan on putting on the floor in here, you will find that the floor can take it no problem at all. The Leaded Corner Summerhouse will need a generous coating of wood treatment shortly after you have installed it. Honestly this is the case with the majority of summerhouses out there these days so it really is not a huge deal. Once a year a new coating should be applied to help keep rot away. 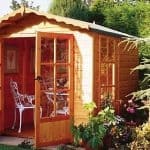 It sounds like a lot of hassle, but treating a corner summer house of this size will take you no time at all. 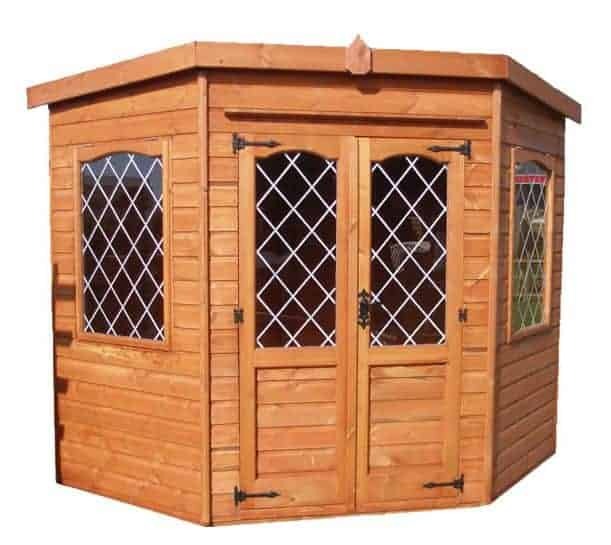 You get a one year manufacturer’s guarantee with this summerhouse. Sure a 5 or even 10 year guarantee would have been preferable, but as this is so well made, if there is a problem with one of the materials then it will show up in that first year anyway so we do not see them only offering a year as a major issue. At 3 feet 6 inches wide and 5 feet 8 inches high the double doors they have used when open offer you all the room you need to get things in and out of the summerhouse. We just love the doors on this and feel that they really give the summerhouse some personality. They have used antique style fixtures on the door which along with the window really do bring it to life in a great way. Just above the door there is a door drip which will help in the off chance the wind is blowing the rain off the front of the structure. In addition to the windows on the door there is also a window on each side of the summerhouse. What we love about the windows is what is actually the main feature of this corner summer house and that is their leaded design. There is this very nice looking leaded design in each of the windows. These are large half glazed windows that are going to ensure a lot of natural light gets into the summerhouse. Also they both can be opened so if things do get a little toasty in there just crack open the window to let in a bit of fresh air. The double doors can be securely locked up so if you do plan on putting something like a TV, stereo or more importantly a mini fridge full of imported beer, then you will feel confident doing so as you can lock up the summerhouse when you are not using it. The windows on the doors and the sides of the corner summer house are quite large, but due to the leaded design of them they do offer you a bit more privacy than you get with standard windows. There is no denying that the redwood looks awesome, but as you need to treat it to make it safe from rot, have a little think about using a coloured wood treatment. These days you have a much bigger choice than just light, dark or clear. You can get it in all different colours so have a look before settling for the traditional kind of wood treatment. There are a number of extras for the Leaded Corner Summerhouse. They offer an installation service for a cost of £130. While we feel the 12 mm thick cladding is strong enough, you can upgrade if you want. There is 18 mm thick premium cladding for a cost of £212. If you want the summerhouse to have a more cabin in the woods kind of look then they have 15 mm loglap cladding which also costs £212. Their last cladding option is 15 mm tanalised cladding which is a rather pricy £265. They also have felt options, heavy duty flooring, thicker framing and a couple of other extras, but to find out about the price of these you have to get in touch with them as they are not listed on the site. This corner summer house is high quality from top to bottom. They really have done an incredible job with this. As they have used top of the line materials for this summerhouse. It is going to last you a very long time. Just remember that keeping the outside free from rot is down to you. This is a very compact summerhouse so there is not a lot of floor space on offer here, but this will work out for people who do not have a whole lot of space in their garden. The space offered can actually go quite far if you plan out your things before you just toss them in. Even a novice when it comes to DIY will have no trouble putting this together. It is designed so that it can be put together with just basic tools. With the help of a friend or family member this will take no more than a few hours to install. 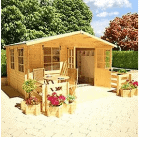 We know that over a thousand pounds for a 6 X 6 summerhouse may see way overpriced, but you have to understand that this is made with the best materials and is actually something of a premium summerhouse so you are getting a lot of quality for your money here. Final Thoughts: The Leaded Corner Summerhouse is one very impressive compact sized corner summer house. We just love the design of this and feel that those leaded half glazed windows on the doors and the sides give it a very old school kind of personality. They have made sure to only use high quality materials and this of course is reflected in the price. But honestly we feel that sometimes you are better paying more to get something that is going to last you many years without any problems. As far as compact summerhouses go this is one of the best we have seen in quite a while.